Coconut Fred's Fruit Salad Island (or simply Coconut Fred) is an American animated comedy television series that aired on Kids' WB in the United States, from September 17, 2005 to May 27, 2006. It continued in reruns until October 30, 2006. The show was produced by Warner Bros. Animation with animation provided by Dong Yang Animation. 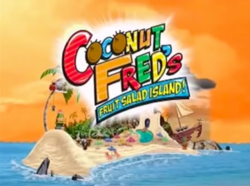 Coconut Fred's Fruit Salad Island takes place on an island inhabited exclusively by fruit. The residents enjoy their own tropical paradise without a care in the world; they must share their peaceful utopia with the joyfully strange Coconut Fred, a whimsical, blissfully foolish coconut with the special ability to materialize anything he thinks about. The plot revolves around the adventures of Fred and his friends, as his boundless imagination springs to life while his friends struggle to cover up the collateral. Any conflict could range from getting a “fruit canal”, to sailing off the island only to find themselves in a humongous storm. Main characters of the series. Coconut Fred (voiced by Rob Paulsen): A happy-go-lucky coconut with a strange imagination. Fred has the special ability to turn whatever he imagines into reality. He can often be heard with his trademark catchphrases "Yay me!" and "Now You're Talking, Coconut!" Bingo Cherry (voiced by Tracey Moore for the first two episodes and by Britt McKillip for the remainder of the series): A shy and timid cherry. Bingo usually hangs out with Fred, Slip and Slide, and Bunga Berry. Bingo is easily terrified, something that Fred doesn't know and usually provokes. Slip & Slide D'Peel (both voiced by Eric Bauza): 'Country' banana brothers. They are less intelligent than the rest of the cast, and often take things a little too seriously. There is no clear way of telling them apart unless Fred or another character identifies just one of them. They're in a band with Fred called "Coconut Fred's All-Body Sound Band", and their music consists mainly of bodily sounds (burping, rude armpit noises, gargling, etc.). Mr. Mel Greenrind (voiced by Michael Donovan): A watermelon. Most commonly assisted by Bingo, Mr. Greenrind routinely attempts to keep everything and everyone in order on the island with his chart of rules known as the squeaky board. A lot of the rules on the squeaky board are really nonsensical, but all of which can be applied to Coconut Fred and his friends. Fred has a tendency to get on Mr. Greenrind's nerves, and sometimes stress him out from all of his antics, though as the series progresses, he was able to show friendliness towards Fred (which usually wouldn't last long). Wedgie (voiced by Brian Drummond): A lemon who works as a sailor. He ended up on Fruit Salad Island due to Fred's intervention. Wedgie spends a great deal of time talking to "Betty", the wooden figurehead. He often fabricates plans to escape from the island, all of which are foiled by Fred's antics, either directly or indirectly. Bunga Berry (Voiced by David Kaye): A mute wild strawberry. Bunga communicates exclusively in grunts and growls. Despite this, everyone is still able to understand what he is saying, and is docile enough to interact with other islanders calmly. Butchy (voiced by Eric Bauza): A gravenstein apple. He is well known as the island's troublemaking bully. He once frightened Bingo, except Fred. Black Berry: Butchy's secretary. As his name describes, he's a blackberry. Butchy keeps him in his pocket. A parody of the BlackBerry Personal digital assistant. Tiffany Pears (voiced by Britt McKillip): A famous singer on Fruit Salad Island. Everybody likes her music except for Mr. Greenrind. In the episode "The Ripley Van Ripend Book of World Records" she had the record for most off-key singer ever to perform in public. Her name is a parody of Britney Spears. B.L. Tomato (voiced by Ashleigh Ball): An outcast tomato that is trying to find out if he's a fruit or a vegetable (although, a tomato is actually a vegetable). In the Season 2 episode "Captain Nut and the Power Fruits", he joined Blendark, Captain Nut's arch-enemy, and turned to the dark side with a new name, the Tomatonator. Aside from the title song, he never starred in any other episode. Rusty Candoo: Fred's friend. He's a can of fruit. His only appearances are the title song and the episodes: "Hocus Pocus Lack of Focus" and "Amuse-Otel". After Amuse-Otel, he never appeared again (except still for the title song and a cameo in "Fred Rules"). Slurpy (voiced by Eddie Deezen): A fruit bat who is bent on eating Fruit Salad Island inhabitants. He is afraid of the light. Melanie Greenrind (voiced by Maria Bamford): Mr. Greenrind's perky niece. She likes to enforce rules even more than her uncle, and carries around a very noisy chalkboard. Vic the Alien: An alien from Loft Lost 57 in the Sasaft Quadrant in the depths of other space. After being mistaken as a tourist to Fred and the island, he was actually planning to invade the island with his spaceship fleet, but because of Fred and his friends playing in his ship and almost destroying them by going into black holes and ramming into asteroids, he aborted the invasion and Fred crashed the ship into Mr. Greenrind's sand castle cabana. They all survived the crash. This was the only appearance of Vic on the show. The episode he was in was the second season "Turn On Your Nut Light". Mrs. Plumcott (voiced by Kathleen Barr): The token little old plum lady of the island. She hates Mr. Greenrind. Her favorite line is, "Oh dear." Dr. Bartlett (voiced by Brian Drummond): Dr. Bartlett is a pear dentist on Fruit Salad Island. Despite some critics praising the animation and creativity, as well as some elements of the comedy, the series has been criticized for its often loud, over-the-top humor. Joly Herman of Common Sense Media posted a review of Coconut Fred's Fruit Salad Island on Go.com. The review describes the show as "the TV equivalent of sugary cereal, and nothing more", and proceeded to give the show two stars out of five. Rob Paulsen, who voiced the main character Coconut Fred, stated that he does not like to remember voicing the character, and said that it was nothing more than a shameless SpongeBob SquarePants knockoff. Other people have also said that this show is a SpongeBob ripoff. Due to the poor feedback that the show received, the originally 13-episode first season was cut short to nine episodes, and the show went on a 5-month hiatus. The final four episodes were branded as Season Two, and the extremely short second season aired throughout May 2006, after which the series was cancelled. Coconut Fred becomes a news reporter. A new volcano is on the island and the gang must stop it before it erupts. Fred tries to be a magician. Fred builds a cross between an amusement park and a hotel, and gets Mr. Greenrind to come along. Bingo Cherry needs to go to the dentist after he gets a toothache. Fred tries to help out Wedgie. Mr. Greenrind leaves Fred in charge of the rules board. Fred and the gang visit Monster Island. A certain fruit on the island catches the hiccups. Fred and his friends go on a Treasure Hunt. Butchy intimidates the island and especially Bingo Cherry. Mr. Greenrind just wants to spend a peaceful day golfing, but Fred and the banana brothers ruin his plans. The gang plays Fruitball at the Island Stadium. Fred gets sick during the Island Carnival, and has to find a cure before the carnival is over. The gang finds a Fruit Bat and tries to parent it. The Banana Brothers are left to repair Mr. Greenrind's door after destroying it. Coconut Fred finds a magical printer and makes duplicates of himself with it. Fred and the gang become Super Heroes to defeat Blendark. A rude baboon upsets the Fruits of the island. After Fred and the gang wish to be in a video game, they have to rescue Princess Greenrind (Mr. Greenrind as Princess Peach) from Butchy (as Sephiroth). Fred is dressed as Cloud, Slip & Slide as Mario and Luigi and Bingo is dressed as Navi. Mr. Greenrind forbids Fred from collecting bottle caps. Sad that he is the only islander to not have broken a record, Fred tries to attain a world record. The Fruits travel through time. In 2006, the series was nominated for 2 Emmy Awards for Outstanding Special Class Animated Program and Outstanding Sound Editing - Live Action and Animation at the 33rd Daytime Emmy Awards.